I gank’d this from urban threads. It is perfect for my sewing room door. I mean, we already call my janome “the robot”. Welcome to the sewing room. 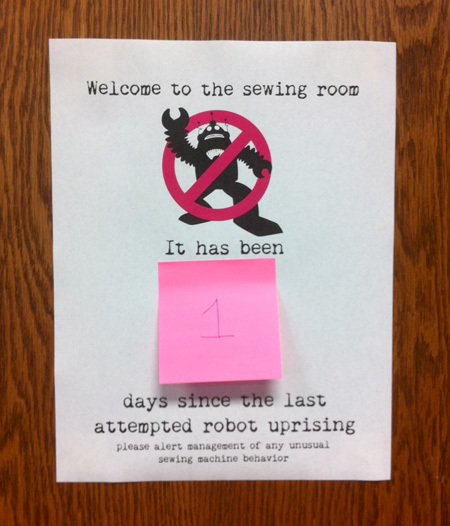 It has been 1 days since the last attempted robot uprising. Please alert management of any unusual sewing machine behavior. A few weeks ago I had the chance to really do some skill building that I hope pays off this year. I attended the American Embroidery Conference, a gathering of machine embroidery enthusiast, digitizers and sales folks. Usually I would make some nasty remark about the sales people but these were really quite nice. My favorite part was being around folks who ‘speak’ creativity. If you know me, you know I’m not shy and plopped myself in the middle of more than one conversation to meet people. And of course, I found the ‘cool table’ while still in line for my badge. It is so fun to sit with women as smart and snarky as myself. Did I mention it was held at the beautiful Palm Beach Gardens Embassy Suites? Oh, and Embassy Suites have a free happy hour. Woot! Ok, back to skills. The conference is set up similar to a SF Con with classrooms and a dealer/vendor room. I was originally surprised by the extra kit fees that aren’t really mentioned on the website but the reality is most sewing classes have kit fees. And I can say every one of my hands-on classes were worth the extra bucks. I knew the pants- fitting class would be interesting but really it was simply fabulous. I got so much out of it. Hopefully I can remember at least a portion of it. We used a Sewing Workshop pattern and made up muslins then the teacher fitted us individually. You know, she looks at your tush and ‘reads’ the wrinkles. It was all smiles, frowns and more wrinkles … the pants I mean. I was told my love handles aren’t a matching set. (left was bigger) who knew? When I was done the muslin was pretty much smooth, you know, after I followed her directions. (Crotch depth adjustment and some side seam movement) Very cool. Hopefully this will pan out with some clothes I can wear to work.